From the Celtic tradition, we get a pair of ancient pagan images who fight for supremacy at Yule. The Holly King and the Oak King are probably constructs of the Druids to whom these two trees were highly sacred. The Oak King (king of the waxing year) kills the Holly King (king of the waning year) at Yule. The Oak King then reigns until Midsummer when the two battle again, this time with the Holly King as the victor. The Holly King, who has evolved into the present day Santa Claus, wears red, dons a sprig of holly in his hat, and drives a team of eight (total number of solar sabbats) deer, an animal sacred to the Celtic Gods. Holly and mistletoe are traditional to the season through commemoration of the battle. The holly was hung in honor of the Holly King; the mistletoe (which grows high in the branches of oak trees) in honor of the Oak King. The Oak King and Holly King are mortal enemies at Midsummer and Yule, but they are two sides of a whole, and neither could exist without the other. Today's Santa is a folk figure with multicultural roots. He embodies characteristics of Saturn (Roman agricultural god), Cronos (Greek god, also known as Father Time), the Holly King (Celtic god of the dying year), Father Ice/Grandfather Frost (Russian winter god), Odin/Wotan (Scandinavian/Teutonic All-Father who rides the sky on an eight-legged horse), Frey (Norse fertility god), the Tomte (a Norse Land Spirit known for giving gifts to children at this time of year), and Thor (Norse sky god who rides the sky in a chariot drawn by goats). Julbock or Julbukk, the Yule goat, from Sweden and Norway, had his beginnings as carrier for the god Thor. Now he carries the Yule elf when he makes his rounds to deliver presents and receive his offering of porridge. When Early Christians co-opted the Yule holiday, they replaced the ancient Holly King with religious figures like St. Nicholas, who was said to live in Myra (Turkey) in about 300 A.D. Born an only child of a wealthy family, he was orphaned at an early age when both parents died of the plague. He grew up in a monastery and at the age of 17 became one of the youngest priests ever. Many stories are told of his generosity as he gave his wealth away in the form of gifts to those in need, especially children. Legends tell of him either dropping bags of gold down chimneys or throwing the bags through the windows where they landed in the stockings hung from the fireplace to dry. Some years later Nicholas became a bishop--hence the bishop's hat or miter, long flowing gown, white beard and red cape. When the Reformation took place, the new Protestants no longer desired St. Nicholas as their gift-giver as he was too closely tied to the Catholic Church. Therefore, each country or region developed their own gift-giver. In France he was known as Pare Noel. 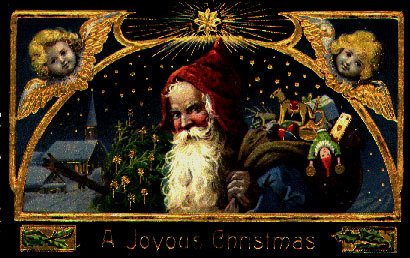 In England he was Father Christmas (always depicted with sprigs of holly, ivy, or mistletoe). Germany knew him as Weihnachtsmann (Christmas man). When the communists took over in Russia and outlawed Christianity, the Russians began to call him Grandfather Frost, who wore blue instead of the traditional red. To the Dutch, he was Sinterklaas (which eventually was mispronounced in America and became Santa Claus). La Befana, a kindly witch, rides a broomstick down the chimney to deliver toys into the stockings of Italian children. These Santas were arrayed in every color of the rainbow--sometimes even in black. But they all had long white beards and carried gifts for the children. All of these Santas, however, never stray far from his earliest beginnings as god of the waning year. As witches, we reclaim Santa's Pagan heritage. Santa's reindeer most probably evolved from Herne, the Celtic Horned God. Eight reindeer pull Santa's sleigh, representative of the eight solar sabbats. In British lore, the stag is one of the five oldest and wisest animals in the world, embodying dignity, power and integrity. From their late Autumn dramatic rutting displays, stags represented strength, sexuality and fertility. As evidenced by multiple prehistoric excavations of stag antler ritual costumes, the wearing of stag antlers in folk dance recreated the sacred male shaman figure called Lord of the Wild Hunt, Cernunnos, or Herne the Hunter, among others--he who travels between worlds, escorting animal spirits to the afterlife and sparking wisdom and fertility in this world. Likewise, the stag's branching antlers echo the growth of vegetation. In America, the stag represents male ideals: the ability to "walk one's talk," and powerfully, peacefully blend stewardship and care of the tribe with sexual and spiritual integrity. In Northern European myth, the Mother Goddess lives in a cave, gives birth to the sun child, and can shape shift into a white hind, or doe. Therefore, the white hind was magical, to be protected and never hunted. In myth, graceful running women of the forest--who were actually magical white hinds--brought instant old age or death to hunters who chased them. To the Celts, all deer were especially symbolic of nurturing, gentle and loving femaleness. White deer hide was used to make tribal women's clothing. White deer called "faery cattle" were commonly believed to offer milk to fairies. In Britain amongst the Druids, some men experienced life-transforming epiphanies from spiritual visions or visitations by white hinds, balancing and healing their inner feminine energy. In Europe white hinds truly exist, and are many shades of warm white cream-colors, with pale lashes--otherworldly in their peaceful and modest behavior. To many Native American tribes, deer are models of the graceful and patient mother who exhibits unconditional love and healthy, integrated female energy. The Wheel of the Year is often symbolized by the wreath. Its circle has no beginning and no end, illustrating that everything in its time comes back to its point of origin and travels onward, over and over again. Scandinavians began the tradition of hanging the wreath at Yule, the beginning of their new year, to commemorate new beginnings in the cycle of life. Today in rural Germany, a giant wreath, known as St. Catherine's Wheel, is a holdover from another pagan custom which involved sympathetic magick to lure the sun's warmth back to the earth. A giant four-spoked wheel with an effigy of a person bound to it, is lighted on fire and rolled down a hill. (The effigy probably hearkens back to a time when human sacrifices were made in plea to the sun.) In some traditions, Yule was a more important holiday for honoring the Sun God than Midsummer. In Winter, Mother Earth was cold and barren without the fertilizing power of Father Sun. Mistletoe was also known as the golden bough and was held sacred by both the Celtic Druids and the Norse. Mistletoe was used by the Druid priesthood in a very special ceremony held around this time...five days after the New Moon following winter solstice, to be precise. The Druid priests would cut mistletoe from a holy oak tree with a golden sickle. The branches had to be caught before they touched the ground. Celts believed this parasitic plant held the soul of the host tree. The priest then divided the branches into many sprigs and distributed them to the people, who hung them over doorways as protection against thunder, lightning and other evils. The folklore, and the magical powers of this plant, blossomed over the centuries A sprig placed in a baby's cradle would protect the child from faeries. Giving a sprig to the first cow calving after New Year would protect the entire herd. Now for the kissing part. Although many sources say that kissing under the mistletoe is a purely English custom, there's another, more charming explanation for its origin that extends back into Norse mythology. It's the story of a loving, if overprotective, mother. The Norse god Balder was the best loved of all the gods. His mother was Frigga, goddess of love and beauty. She loved her son so much that she wanted to make sure no harm would come to him. So she went through the world, securing promises from everything that sprang from the four elements--fire, water, air, and earth--that they would not harm her beloved Balder. Leave it to Loki, a sly, trickster spirit, to find the loophole. The loophole was mistletoe. He made an arrow from its wood. To make the prank even nastier, he took the arrow to Hoder, Balder's brother, who was blind. Guiding Holder's hand, Loki directed the arrow at Balder's heart, and he fell dead. Frigga's tears became the mistletoe's white berries. In the version of the story with a happy ending, Balder is restored to life, and Frigga is so grateful that she reverses the reputation of the offending plant--making it a symbol of love and promising to bestow a kiss upon anyone who passes under it. Balder is sometimes seen as the sacrificed and resurrected god, who is restored to his people after the Battle of Ragnarok. Winter was a time of death and stagnation in the eyes of early humans. The earth was barren and unproductive, shelter was drafty, disease was common, and food was scarce. Little wonder they did all in their power to assure the Sun's return each year. During the festivals of the waning year, fire became a form of sympathetic magick to entice the Sun back to the earth. Bonfires were lit; Flaming wheels rolled down hillsides; Burning candles were placed in windows. Candles were later placed in the boughs of evergreen trees, later evolving into lights on our holiday trees. Honor the new solar year with light. Do a Solstice Eve ritual in which you meditate in darkness and then welcome the birth of the sun by lighting candles and singing chants and Pagan carols. If you have an indoor fireplace or an outdoor fire circle, burn an oak log as a Yule log and save a bit to start next year's fire. Decorate the inside and/or outside of your home with electric colored lights. Because of the popularity of five pointed stars as holiday symbols, this is a good time to display a pentagram of blue or white lights.